One of my favorite cool-weather dinners is soup! I love curling up with a warm bowl of hearty beef stew in the fall and cold winter months. When you slow cook beef with classic vegetables such as potatoes and carrots, it’s almost impossible to mess up. This recipe takes some time, but is still fairly easy. I don’t like to use any bullion or store bought broth….although you can. I used all fresh herbs in this recipe. Sprigs of fresh herbs are found in most grocery stores in the produce section. There is a difference in flavor when you cook with fresh herbs. If you don’t have any fresh dried herbs will do fine. There are many ways to make beef stew, this is what I did for this recipe. 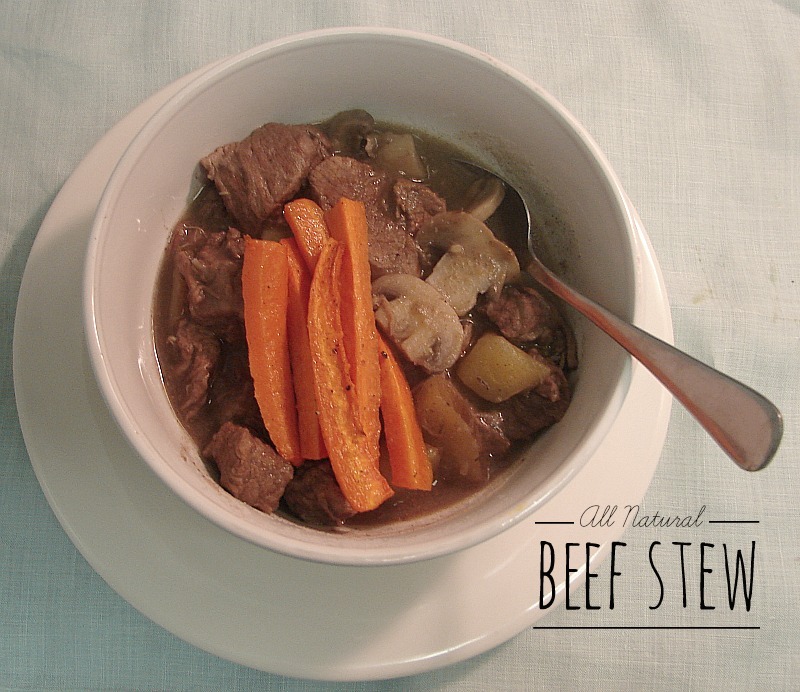 A simple way to make beef stew using fresh ingredients. In a large bowl pour 1/2 cup Merlot over beef and let sit for about 30 minutes and set aside. In another large pot, crock pot or dutch oven place olive oil and diced onion and shallots over medium heat until caramelized. Sprinkle flour over onion mixture and cook for a few minutes, (you may want to add a tbsp of butter) then add potatoes, mushrooms and carrots, meat, and seasonings, cover and let steam over medium-low heat for about 5-10 minutes. Then add water and a little more of Merlot stir and bring to a simmer. Once simmering reduce heat to low and cover, stirring occasionally. This will remain on low for a few hours, I usually let it sit for at least three. You want the flavors to mix, and the meat to be looked thoroughly. You may notice the meat is tough at first, the longer it cooks the softer it will get. You want it to be a pull apart consistency. After it has cooked for at least 2-3 hours, sample the stew and add more salt, pepper, seasonings and Merlot to your liking. Once the meat is no longer pink, pulls apart well and appears done you can remove from heat and serve. I usually start out with a tbsp at a time of rosemary and thyme, and a tsp of salt and pepper. I add more during cooking until I feel it tastes right. Always check before you serve because salt cooks out, so it may need a little more before serving. You can slow cook this for 4-5 hours. The longer you cook on a low simmer the more tender the meat will be. As long as the meat is cooked through you can serve usually as early as early as 3 hrs. As long as you brought it to a boil and then turned down and let simmer. This recipe for beef stew is fairly easy, although it does take some time. If you have down the ratio of ingredients you like you can put it in a crock pot to let it slow cook all day. Practice and try different ways and make it your own. If you notice this recipe makes a lot! I am a huge fan of storing for later. If it takes you all day to cook it, doesn’t saving more for later make it worth it? You can package it up and refrigerate for the next few days or freeze it to last throughout the season. Or package the broth for other recipes that call for a beef broth. I used a 9 qt enameled cast iron pot for this recipe. Which is very large, you don’t have to use a pot that large such as, Le Creuset Signature Caribbean Enameled Cast Iron 5 Quart Oval French Oven with 2 Free Stoneware Cocottes It is larger than a crock pot and works well cooking evenly and slow at a low temperature. Happy cooking! Leave a comment in the section below, I would love to hear your thoughts.